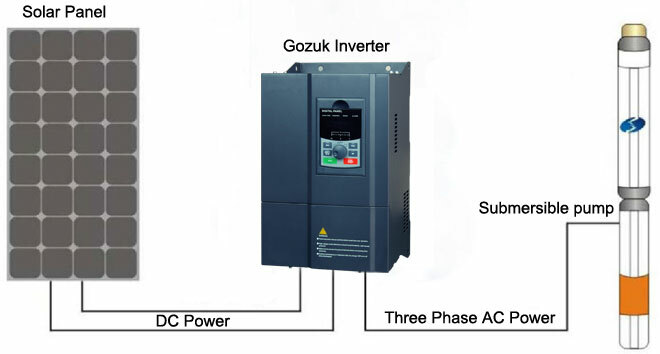 What is your opinion about running AC submersible motor pump by Solar Energy using DC-AC inverter? Working on one of my project on ground water extraction for small irrigation in one of the off grid areas, I found a party quoting us the solution of running AC motor via Solar Energy using inverter. I am still in search of a suitable answer, is It Workable Solution because of the huge efficiency losses? The use of the AC motor buys you some benefit in that with the higher voltage, lower current (i.e. smaller wires, could be important for a long run- deep well) Additional calculations are needed to understand the losses by going with the inverter vs a dc motor. I am also assuming that battery power/storage will be employed for operation during night time/cloudy day functionality. This too needs to be considered. What I am saying is that solar inverter is a poor man's method to shaving costs. And don't look at the unit price, overall cost of ownership numbers need to be understood. The nice thing about staying all in DC is that you do not need batteries not inverter nor anything really. The only reason you would need batteries would be to run when you do not get any sun. Remember that it is cheaper to store water than it is to store electricity. In AC, your inverter will not kick in until you have a given voltage, and then it has a timer which prevents it from frying itself for going on and off too rapidly. So on days when you have lots of small clouds, it is a problem. Hence the almost indispensable need for batteries. They act like a buffer. A couple of years ago I installed an off grid system and the owner had purchased a "solar pump" from Gozuk. I runs on ~30-250VDC and 90-240VAC so it must have a rectifier and smart controller built into the pump. I have run it off the 48V battery bank, but in the end have left it connected to the output of the 220V inverter. Total lift is ~400 feet to the water storage tank. Actually if you use a solar motor controller, you can go DC-AC without using the classic inverter. Power production is not watt driven but frequency driven, as the sun goes up the motor picks up speed. Several advantages here, AC motors are cheaper, you don't have to pull an existing motor out the hole to replace. We are capable of driving a 10-hp motor with a single controller (including 3-P 480-v), no batteries are needed, complete off grid solution. Can we run submersible pump using solar energy and if so up to which capacity (HP) pump can be operated?? This is Siddique. I am interest regarding "solar powered inverter" for single phase water pump. I need `Inverter' which will run by directly Solar Panel in day time.​ Such kind of Inverter is available with you, for supply.​ I wish to use this Inverter in bangladesh for local market AC water pump. I want to run 15 Kw power ac appliance for fans, submersible pumps for irrigation, grass cutting machine etc. with the solar panel without batteries. Have you any solution for that with variable frequency drive or any other? i have 3hp ac pumps i want to run by solar panel with vfd device its possible? I'm planning to run AC submersible pumps with solar panels at some places. I want to run all of them in daytime without any battery backup. Some of them AC 220 and 380V.